Izhar Gafni makes a bike from cardboard for $9. Engineers told Izhar Gafni that a cardboard bike was impossible. But he went ahead and made one anyway. An ardent cyclist and skilled mechanic, Gafni found a cardboard bicycle taking shape in his mind. American engineers he consulted solemnly nay-sayed, but he couldn’t let go of the idea, he told the Israeli tech blog NewsGeek (in Hebrew). The burly man’s eyes twinkle under his mop of curly hair as he tells what made him push it forward. “My wife told me, ‘If you’re not going to try it, you’re going to drive yourself crazy. Then you’re going to drive me crazy, then drive the entire family crazy. So just go ahead and try it! '” Encouraged by domestic support, inspired by origami, and remembering the success of another “impossible” project – the creation of jumbo jets – Gafni took his skills and built a road-worthy bicycle out of corrugated cardboard sheets. The first prototypes worked, but “they looked like delivery boxes on wheels,” Gafni says. Investors weren’t interested. Gafni realized that the cardboard bike needed a more attractive design. With that in place, plus applications of materials to make it withstand moisture, it became a bike that anyone would want to hop onto. How does the cardboard bicycle hold up? Well, it takes up to 140 kg. in weight. It’s waterproof. If you watch the 6-minute video below, you will see Gafni cycling carefree through puddles. The video is in English. And once the bike hits the market, what will be the price to the consumer? An incredibly cheap $60, and up to $90 with extra attachments like a removable motor. Production costs of only $9-12 make this eco-friendly bike available even to teenagers with babysitting money. According to The Fiscal Times, it’s a commercially viable product with potential appeal to the hospitality industry. 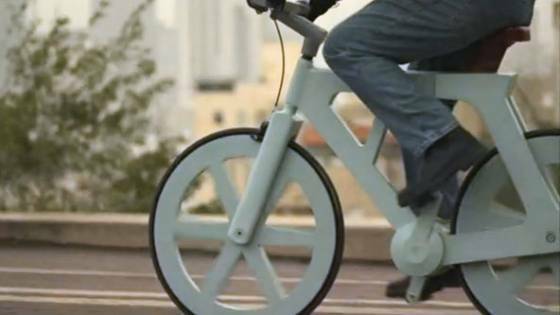 Gafni created the cardboard bike with the urban cyclist in mind. The Israeli press points out that it’s so cheap that it’s not worth stealing: in towns like Tel Aviv, where people cycle everywhere, bicycle theft is a scourge. To us at Green Prophet, being easy on the wallet is certainly a plus. But the biggest advantage of this cardboard bike is how gentle it is to the planet. CLICK HERE for more photos of the cardboard bike. Photo of Izhar Gafni’s cardboard bike via The Fiscal Times. Previous Previous post: Bananas to Cure Our Minds and Bodies? He definitely didn’t build that. I would definitely like to buy one of these bikes. My bike is over 10 years old and I don’t want to buy one of these new fancy super bikes cause their producers don’t care about the nature! Please let us know when the bike will be on the market and where we can buy it. I like Bycicles and I like green technology, so a really great project! The only information which I miss is (beside the question when we can buy it) is what does it weigh? Riyad, the article says that the cost to the consumer will be in that range, once the bike appears on the market. Everyone hopes to see it on the market soon. so the article says he sells the bike for $60- $90 …is that in Israel? Where? how? Deryck, if you look at the video, you’ll see it’s industrial corrugated cardboard. Very Cool! Can anyone tell me what the name of this cardbard is? Is it a specific material of different thicknesses? I understand that Izhar Gafni is still negotiating with investors to start production on a large scale. Can’t wait, either! That is awesome! I’d love to get one. Will it be sold in the US markets? Awesome, dude! That is the absolute coolest project ever! I would love to have a $60 cardboard bicycle! I think I’d hang it on the wall as a piece of art. I hope you make some serious money on this thing because it is brilliant.